Water is essential for every living thing. Birds are more efficient at using it than most mammals, but many are drawn to birdbaths, both for drinking and for bathing. Backyard fountains can be especially attractive to birds and people. Birds that live in your area may visit your birdbath regularly, but a much bigger variety may notice the activity of other birds or the sounds from the fountain as they're migrating through, and may stop for a quick drink. 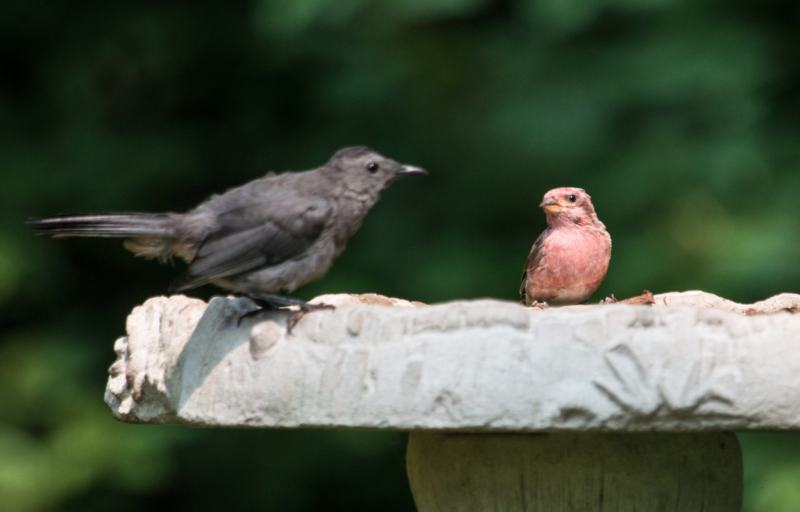 Regular old birdbaths can attract a good variety of birds, like this Gray Catbird and Purple Finch. Set the birdbath where birds can quickly hide in a thick shrub or potted plant if a hawk passes through, or simply to perch while preening after the bath. Never set a birdbath anywhere where cats may lurk. Birdbaths designed to look natural, with gurgling fountains, attract both local birds and interesting migrants. Make sure you keep your birdbath clean. Remember this is a source of drinking water for them, but also that some birds bathe in the water, so it can get germy. Some of the most dangerous mosquitoes lay their eggs in standing water, including birdbaths. Changing the water every two or three days will prevent any mosquitoes from emerging. 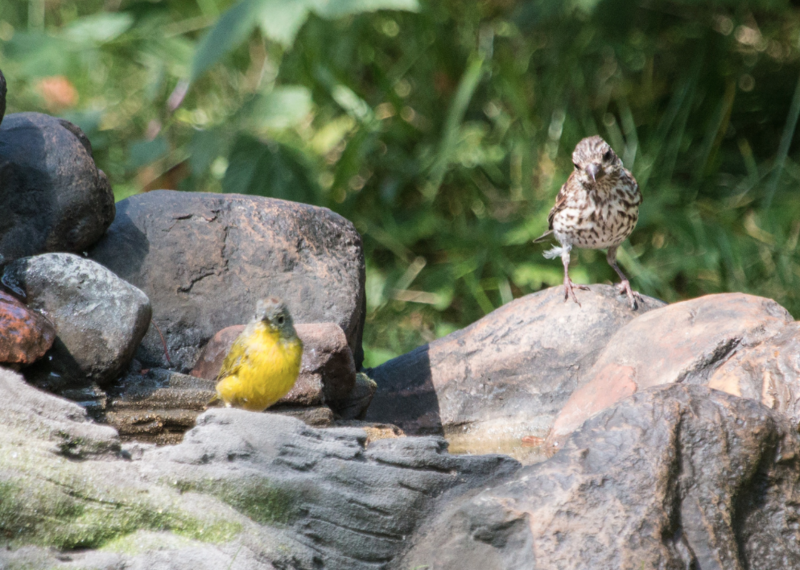 Nashville Warbler and female Purple Finch. Algae eventually starts growing on birdbaths. Don't use algaecide or other toxins in the water. Pennies have dangerous levels of zinc. 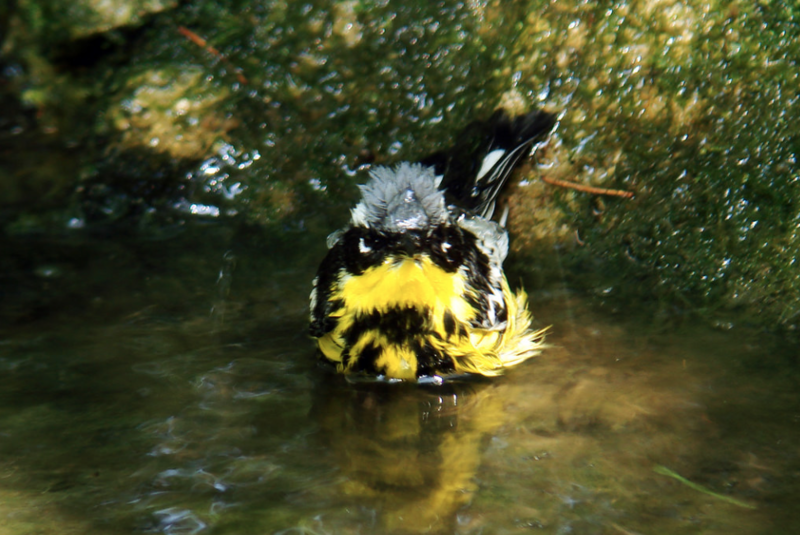 To prevent algae, use a stiff brush to vigorously wipe the birdbath when changing the water. If algae does start growing, you may need to soak the birdbath in a strong bleach solution after cleaning. Make sure you thoroughly rinse and dry it after this.